The Mustang boys pride themselves on a hard-nosed defense and transition offense. Leading the way will be top returners Philip Bury (a 6-foot-4 senior forward), who was the Mustangs’ top scorer and rebounder last season; Darek Khabani (a 6-foot senior point guard); and Jalen Lund (a 6-foot-1 senior shooting guard). Junior forward Aidan Rolfs stands at 6-foot-7 and is the team’s most improved player over the last year, said head coach Todd Rubin. “We have a group that makes good decisions in the open court and can shoot from the outside. To be successful, we have to play at our pace and rebound,” Rubin added. As each season arrives, girls head coach Ashley Graham adjusts her coaching philosophy to match what players she has on the roster. There are two constants on tap: “We’re always pushing effort and discipline on the team,” she said, adding that the coaches are looking for those crucial qualities each practice and every game. This season, there’s an added factor on the court as the Mustangs return to 4A KingCo after competing the last two seasons in 3A KingCo. It will be challenging, Graham said, because they haven’t had the chance to fully scout their opponents, but they’re up to the task of battling some solid squads. Top returners are junior Britton Steckler (a 5-6 guard), senior Caroline Talbot (a 5-8 guard), senior Lauren Lund (a 5-6 guard), junior Sami Castanos (a 5-11 guard) and junior Whitney Thom (a 5-11 post), who was injured most of last season and is a strong presence on the rebounding front, Graham said. In a 51-50 overtime loss to Ferndale to start the season, Talbot led the Mustangs with 17 points. Redmond’s keys to success, according to Graham, will be strong defense, limiting turnovers, getting in passing lanes and obtaining more possessions to score. Head coach Tyler Mendezona feels his Grizzly boys have a good shot at bringing a high level of competition to their league this season, including gritty defense, team rebounding and high-percentage shooting. Top returners are senior Trevor McRae (a 6-foot guard) and junior Jace Blankenbeckler (a 6-2 guard), and top newcomers are sophomore Morten Hansen (a 6-1 wing) and sophomore Connor Keith (a 5-10 guard). 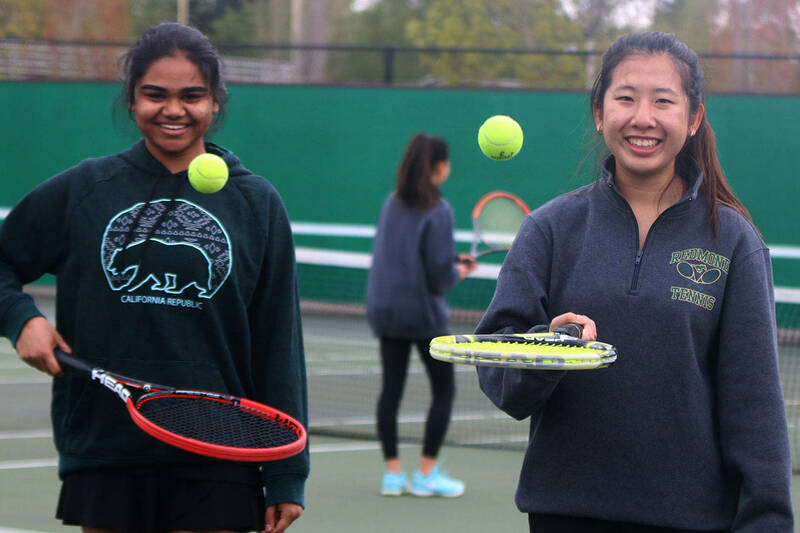 Bear Creek’s hard-working girls team — which consists of just four returners — aims to improve and make each other better, said head coach Ali Greene. Top returners are senior Haley Jones (a 5-6 guard) and senior Tiffany Cowman (a 5-9 post) , and top newcomers on board are senior Juliette Shields (a 5-8 post) and freshmen 5-6 guards Sophia Dunn and Carly Preston. Greene would like to see her players develop their skills, tackle challenges and learn from their mistakes throughout the season. “I try and push them outside of their comfort zone and get them to lean on their teammates. Developing a team-first attitude is one of the most important things we teach them,” she said. Led by new head coach John Augustavo, the Owl girls are a young, hard-working squad. “Our strengths for a successful year will be to keep everyone healthy and to make sure all the players are enjoying the game and improving as the weeks go by,” said Augustavo, who coached at Inglemoor High from 2002-2015 and led his teams to four state tournaments. Top returners are junior Eliza Friend (6-4 post), sophomore Kaku Cosmos (5-8 guard) and junior Annabelle Wiley (5-8 wing) to go along with top newcomers in freshmen Rachel Sapirstein (6-0 wing), Addie Sapirstein (5-7 wing) and Mary Cosmos (5-7 guard). Augustavo would like to see his squad become stronger each time on the court and instill a team concept along the way. Boys head coach David Bigelow is also new to the Owl hoops scene and his team is anticipating a season packed with high-level, competitive basketball. A host of seniors graduated last season, so players will be adjusting to new roles early in the campaign. “I want everyone on our team to know their role each day and to feel empowered to meet and exceed the expectations for that role. We will play with pace, space and intensity,” the coach said. Leading the way on the returner front will be senior Trey Rudolph (a 6-foot guard), senior Zach Foster (a 5-10 guard), sophomore Oliver Thomas (a 5-9 guard) and sophomore Alan Ngouenet (a 6-2 forward). Top newcomers are sophomore 5-10 guards Roman Peterson and Conrad Im. During their time with the team, Bigelow aims to guide his players through a growing and competitive experience.